Today, 24th February, is World Yoga Day. So I thought it would be fitting to hand over my little blog to Giselle Shardlow for my first guest post. Giselle manages to combine being a mum, yogi, teacher, author, wife, mentor, advocate and friend all with the most amazing enthusiasm. I hope you enjoy her wise words…..
Giselle Shardlow is a children’s author of Kids Yoga Stories. She hopes to inspire children by drawing from her experiences as an international primary school teacher, yoga teacher training graduate, world traveler, mother, and yogi. She lives in San Francisco with her Australian husband and daughter. 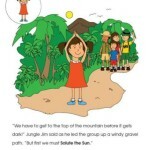 Her yoga-inspired children’s books can be found at www.kidsyogastories.com or on Amazon worldwide. I love practicing yoga with our daughter. It warms my heart. We learn, move, and have fun together. It’s awesome. We are on this yoga-inspired journey together, and I’m learning from her every day. By introducing a light and playful yoga practice at home, I hope to encourage our daughter to build a healthy lifestyle, take responsibility for her actions, be compassionate, and generally enjoy a happy life. While reading some of your favorite books with your toddler, try acting out the characters in the story. We love the Bill Martin Jr. and Eric Carle books, for example. With Baby Bear, Baby Bear, What Do You See?, try hugging a tree like a baby bear, walk on your hands-and-knees like a red fox, spread out like a flying squirrel, tiptoe like a mountain goat, and flap your wings like a blue heron. 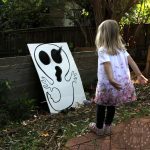 Don’t worry about doing perfect poses; just encourage your child to have fun with movement and story. You will be surprised at how many actions turn out naturally to be similar to yoga poses. Image of our well-loved Bill Martin Jr / Eric Carle books. Try using a smaller yoga mat for your little one. Pick up a mini-yoga mat or cut a regular one to a smaller size. Our daughter used to love playing underneath me when I practiced my morning yoga, but now, she proudly brings out her own yoga mat. Yoga mats are obviously not a mandatory part of a yoga practice, but having a special place to practice becomes a sacred part of the process. Feel free to add other special rituals (like bringing out a meaningful object, having a special cuddle, lighting a candle, or turning on music) to mark the start of your yoga experience together. Image of our daughter in Child’s Pose on The Little Yoga Mat. 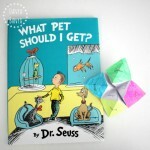 Danya Banya recommends the Schleich life-like animal figurines to accompany the That’s Not My… book series, and we used them when our daughter was an infant. Now, we act out the animals while practicing their sounds, too. You can stretch up like a giraffe, walk like a bear, make your hands into moose’s antlers, or crawl like a tiger. You could also bring out your stuffed animals or animal fridge magnets instead of figurines. Then, add some thematic music to get you both in the mood. Your toddler will probably come and go from the practice, but just keep going… your enthusiasm will bring them back to the fun. Image of some of our Schleich animals. highly stimulating and stressful life now and later on. and playfulness. Positive reinforcement and repetition is the key. Image of our daughter in her ‘elephant’ pose at Death Valley National Park, California. life as he grows up. We just got a Spanish kids yoga video and absolutely love it. It’s a delightful children’s yoga class by Lina of Umbral Yoga. The music is engaging, and her Spanish instruction is easy to follow along, even if you know only some basic Spanish. Our daughter sits on the bolster or on her yoga mat and watches Lina’s students as they pretend to visit the beach, the farm, and Africa. She joins in with her little “om” to start the class. Then she pops up at different times to “pick coconuts,” “eat leaves like a giraffe,” or “sway like a tree.” We talk about the different animals and things we see along the journey. Kids Yoga Videos are available in English, too, or you can check YouTube. It’s a fun way for our daughter to see older children practicing yoga in a more structured environment. Please note that we are not advocates of infants watching TV, and we encourage you to do what’s best for your family. Kids yoga books are also a great option. When we go for hikes, we like to talk to our daughter about what we see in nature. You could pretend to stand on one leg likes trees, grow like flowers, hop like kangaroos, squat like possums, hug trees like koalas, or fly like birds. The physical postures (asanas) of yoga were invented centuries ago by Indians imitating their natural surroundings. We can invent our own asanas even today. 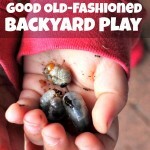 This is a fun way to discuss and experience Mother Nature through movement. Every yoga class ends in Corpse Pose (Shavasana), which becomes a treasured part of the experience. Practice different ways of relaxing together by having your child lay flat, belly-to-belly; having them lay beside you, tucked under your shoulder; or sitting up on your belly, supported by your bent knees as you lay on your back. Take the opportunity to bond and connect together in silence. Tune in to each other. Focus on your breath. Let your worries fall away. On a recent road trip around the southwestern United States, our daughter would spontaneously do a Downward-Facing Dog Pose in different locations. A friend also told me that her daughter used to drop down into Lotus Pose while waiting in a grocery line. There are many opportunities to just “do yoga” whenever, wherever. For example, you could hold your child close when you are riding the bus, so he can feel your belly breath. Or you could both do small twists or balances while waiting at the doctor’s office. 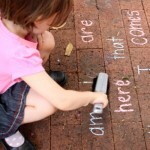 Encourage their creative expression and movement. We can learn the principles of yoga from our toddlers, as well. They are also our teachers. 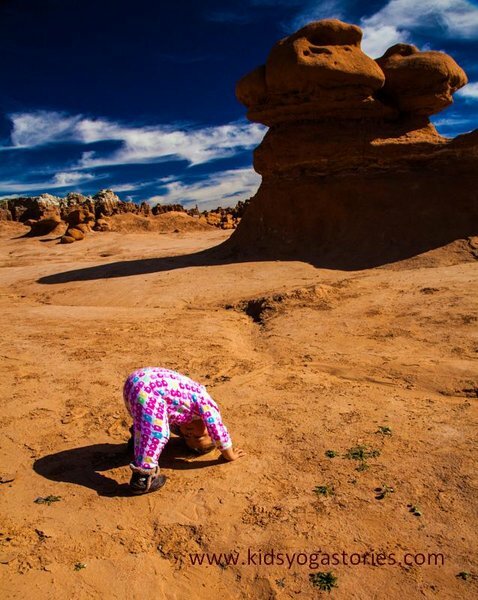 Image of our daughter doing Downward-Facing Dog at Goblin Valley State Park, Utah. As you will see, yoga is so much more than the physical postures. This ancient wisdom also teaches us about breathing, mindfulness, relaxation, mantras, and the guiding principles to becoming a happy, responsible, and compassionate human being. Sharing the gift of yoga with our daughter brings me so much joy. I’d LOVE to hear from you if you have any other ideas for creating a yoga-friendly household, or if you have any questions, please email me at giselle@kidsyogastories.com. If you are interested in more information, read about the benefits of storytelling and yoga, or the history of yoga. Also, check out Giselle’s yoga-inspired children’s books and get more free kids yoga resources in your inbox by signing up for her weekly newsletter, or check her out on Facebook, Twitter, and Pinterest.